SpyGlass is completely dedicated to making sure that every game designed is what gamers are looking for. To accomplish this, we start from the foundation up with input from the community. Watch our Board Game Geek page for frequent polls so that you can offer up some insight into our process. Crowd-sourced input allows us to produce games of the highest quality for you, the gamer. Our artists produce beautiful, professional artwork for each game we create. Of course, we are dedicated to the gamers every step of the way, which is why we go through Kickstarter for crowd-funding. Our loyalty resides with you, the gamer, and the entire gaming community. Life is a game, play happy! VENOM Assault's new expansion, Villains and Valor, brings and all new dynamic to the base game that takes the fight to an all new level! Check out the Kickstarter for all new, exciting details, and join us April 9th, 2019 for the kick off! The Hunt is ON! This fast paced, competitive, dice rolling game pits you against your fellow gamers in a race to see who will be the first to discover whether Sasquatch truly exists! Be careful, because there's more than just one legend out there, and some of them are dangerous! If you want to know more about Hunting Sasquatch, visit the game page. Don't forget to sign up for our newsletter to keep up to date on Hunting Sasquatch's progress: Sign Up! 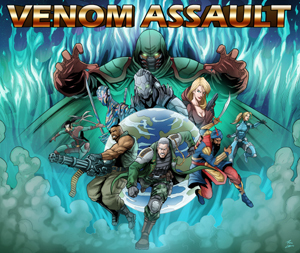 VENOM Assault has funded on KickStarter! The long road to completion is over, and the amazing efforts from over 400 backers has pushed the Kickstarter campaign into success! We wish to thank everyone who supported VENOM Assault, and we are shipping to you as you read this! If you want to be among the first to own this title, check out our Store, or if you want to know more about VENOM Assault, visit the game page. We are very excited, and look forward to our backer's feedback about VENOM Assault! 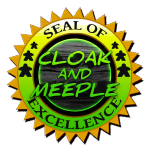 Winner of Cloak and Meeple's "Seal of Excellence"! Check out Cloak and Meeple's reason behind the honoring of this prestigious award on their website!